In a medium sized bowl, mix yogurt with sunflower seeds and organic honey. 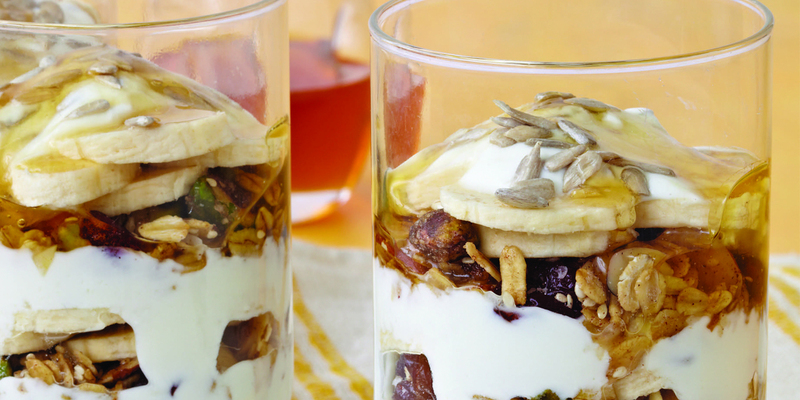 Place half in the bottom of a parfait glass, then place 1/4 cup of granola on top of it. Layer the bananas in next and repeat the process until all the ingredients are in the glass. Garnish with a drizzle of honey and toasted sunflower seeds. Beau’s thoughts: Make sure use an organic Greek yogurt and always use ripe bananas. The key for this recipe is the coconut granola – it brings a lot of great mouth feel to a simple parfait and leaves you with a great coconut finish.